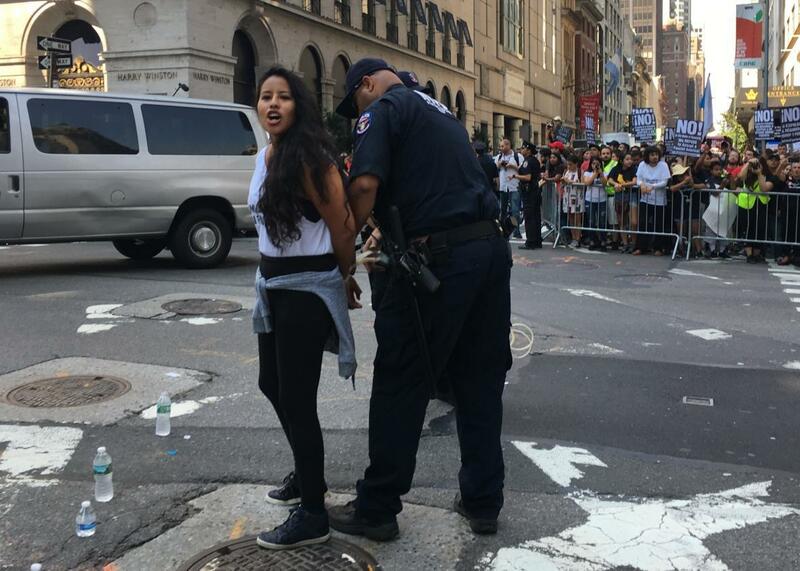 Human lives couldn’t outweigh Trump’s shoulder chip: A dispatch from the protest over DACA at Trump Tower. A protester outside Trump Tower on Tuesday. Soon the group marched down Fifth Avenue to Trump Tower, where hundreds more joined them. Around a dozen people sat down cross-legged in the middle of the street, holding hands and waiting to be arrested. Among them was 26-year-old Maria Fernanda Cabello, an immigrant rights activist and DACA recipient from Texas. For her, the fact that Jeff Sessions, a prime enemy of the immigrant rights movement, had gotten to pronounce DACA’s death was an extra twist of the knife. “Trump didn’t even have the courage to do it,” she said, shortly before she was taken away in handcuffs. Again and again during this wretched administration, people have gathered—in airports, in congressional offices, in the streets—and pleaded with our political leaders not to destroy lives. Protest has been effective when there have been chokepoints in the system other than the president’s conscience. State attorney generals challenged Trump’s Muslim ban, and courts rolled back some of its worst provisions. Under pressure from desperate, terrified constituents, Congress gave up its efforts to trash the Affordable Care Act. But with the Deferred Action for Childhood Arrivals, or DACA, program, there was no power to check Trump. According to Politico, the president might not have liked the idea of deporting blameless young people, but he “chafes at hearing that ‘New York Democrats’ are powering his administration.” There was no way that the lives of hundreds of thousands of young people could outweigh Trump’s personal resentments. Last week, Mike Allen reported in Axios that many Trump staffers were expressing above-average angst about the administration’s potential cruelty on DACA. “This is different,” one source told Allen. “This is families being torn apart. This is something that will follow [the aides] when they go back to real life.” These anxious staffers are right to worry and may in fact be underestimating the shame that will now follow them for their rest of their careers. Not only did people like Gary Cohn, Steve Mnuchin, and Jared Kushner fail to moderate Trump, they may have inadvertently stoked his worst instincts, pushing him toward a petulant display of dominance. Their collaboration now has its first identifiable victims. The so-called Dreamers will have to demand that Congress rise to the occasion. This seems unlikely; the term Dreamers stems from the campaign to pass the pro-immigrant DREAM Act, whose failure led Obama to enact DACA in the first place. But the activists are not going to leave the only country they know, which means they have no choice. Before Tuesday’s protest, I asked Cabello if she was scared of getting arrested. “The first thing that I feel in my body is anger,” she said. “Instead of fighting for permanent protection for my parents and the rest of the immigrant community, I have to fight to try to keep this small victory.” Movimiento Cosecha, she said, is determined not to let Dreamers be used as bargaining chips to help Trump extract new immigration crackdowns from Congress. “We’re holding the line. You’re not going to use Dreamers to hurt my parents. We’re collateral damage right now for a wall and for more enforcement,” she said. The demonstrations have just begun.